Your liver is failing critically. A transplant would save your life, but there’s a long waiting list and the odds are stacked against you. So instead, doctors extract some of your bone marrow, liver and muscle cells, go back to their laboratory and return in a few weeks with … a freshly grown liver! Does this sound like material from a Hollywood sci-fi movie? Well Not anymore. Australian researchers in Melbourne are now hard at work growing spare parts, proving their stuff in animal – and even human trials! “It’s a remarkable field, with enormous potential,” says Wayne Morrison, director of the O’Brien Institute at St Vincent’s Hospital in Melbourne and professorial fellow in the department of surgery at the University of Melbourne. “There is a sense of steady advance,” Morrison says, noting that a key reason for progress is the multidisciplinary nature of tissue generation and regeneration. Morrison is a plastic and reconstructive surgeon. Part of his work involves transplanting blood vessels from a healthy part of a patient’s body to a diseased or injured part to aid recovery. He noticed the new blood vessel would start to promote tissue growth, although the process wasn’t easy to observe. “We came up with the idea of enclosing the [growing tissue] in a plastic chamber that was surgically inserted into the patient’s body,” he says, explaining that the idea was to see what was happening. Further experiments revealed that the location of a chamber determined the types of tissue that were generated. Morrison says it’s not clear how this happens but he suggests it may be linked to the proximity of other types of cells, which cue the formation of the new tissue. 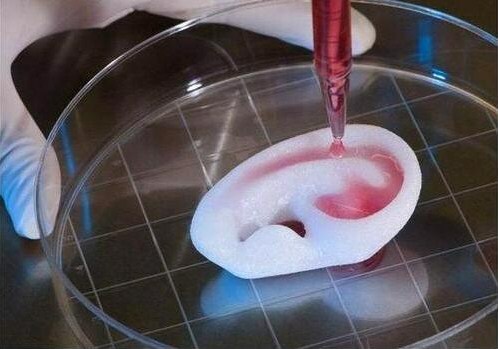 When it comes to growing new tissues for transplants, the truly sci-fi advance is the bio-printer a device that “prints” three-dimensional tissue on to a template. A Melbourne company Invetech developed the technology for Organovo, a biotech firm based in San Diego, California. The bio-printer works by dispensing cells taken from the patient’s body, layer by layer, to create a 3-D tissue or organ. A gel is used to fill in gaps and provide physical support while the cells organize themselves into patterns and bind together. The gel is removed in the lab during a maturation process and the fully formed tissue or organ is then ready for the surgeon to transplant into the patient. Invetech delivered the first bio-printer to Organovo late last year and Davis predicts production models will roll out soon. It would seem as though science is really making head way into the future. While creating living tissue is important, the larger aim for science and medicine is creation of functioning human organs. Scientists have very high hopes that one day on the horizon not only organs can be grown in a lab but also nerves and tendons lost in such cases as spinal cord injuries and paralysis. Organ replacement will eventually enable humans to have indefinite lifespans through complete rejuvenation to a youthful condition. Hi Maria! This is gorgeous! Good stuff. I believe it’s highly important to let everyone know what life extension is about and how important for people’s lives and health the research advances are. You should also let everyone know that life extension leads to overpopulation, meaning that in fact, not everyone’s lives are extended. Life extension does not lead to overpopulation. Uncontrolled child birth does. Overpopulation seems scary, because you think there’s not enough resources for everyone. This can be easily managed. One of the main resources is the Sun. It’s not going anywhere for another several billion years. The other crucial resource is knowledge. Oil wasn’t even known to exist in the beginning of the 2nd millenium. It’s the collective intelligence of the humanity that is capable of providing food and water for everyone. So, don’t be scared by the thought of overpopulation, it’s not going to be a problem at all. However, cancer, Alzheimer’s and other age-related diseases are huge problems of the society. We have to deal with them first. This means we have to defeat aging. And by doing so we will save hundreds of millions of lives. Thank you so much. You are welcome to use any content you may like.